Britain's 650-year-old treason law could be updated to allow jihadists returning from Syria to be prosecuted, the Home Secretary has said. 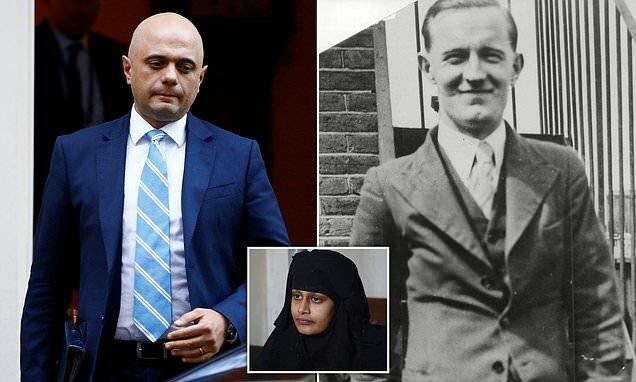 Sajid Javid told the House of Commons yesterday that a change to the 1351 Treason Act was 'worth considering carefully'. The last person convicted of treason in the UK was wartime Nazi propagandist Lord Haw-Haw who was hanged in 1946. Mr Javid was asked by Tory colleague Julian Lewis whether he would consider revamping the treason law to 'specify that it is treason to support a group that one knows intends to attack the UK or is fighting UK forces'. Oxford constitutional law professor Richard Ekins had argued in an article on Sunday that the 1351 law should be updated. The Home Secretary replied: 'This is a complex situation and we should always be looking to see what tools we have at our disposal to ensure that those who are guilty of terrorism, or of supporting terrorist groups, are brought to justice. 'That means ensuring that we have the right laws in place. 'There are already powers in existence, including those covering extra-territorial jurisdictions.